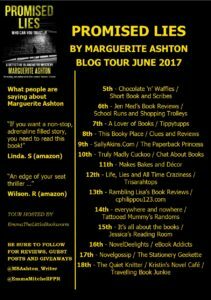 I’m so pleased today to be posting about Promised Lies by Marguerite Ashton. Here’s what it’s all about. 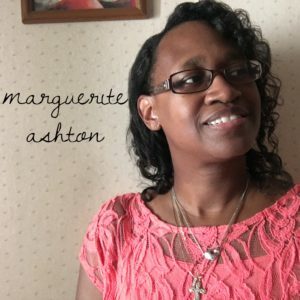 I’ve now got a great Q&A with Marguerite. Hope you enjoy it. Tell me about your journey to publication. Is Promised Lies your first book? Promised Lies is my 1st novel to be to be picked up by a publisher: About two years ago at a writers’ conference, I had the opportunity to sit down with a literary agent who gave me great advice and informed me that my word count was too low. This inspired me to re-write that book, adding depth where readers found questions, and expanding the second book in that series which will come out in late later 2017. I have three books that were published, but that didn’t work out. I now have the rights back to all of them and I’m currently rewriting those books. I understand you are a member of Sisters in Crime. Could you tell me a bit about what it is and how you became a member? Sisters in Crime supports women mystery writers. Although it’s not just for women. Men can join too! They also provide resources to help writers along in their career, including grants and events. In 2012, there was a writer’s conference hosted by Lee Lofland called Writers Police Academy. Sisters in Crime offered discounts for members (first time attendees) to WPA. I signed up and was grateful for being able to attend WPA. You have five children (wow!) – how hard is it to juggle being a mother with being a writer? Very hard. Three out of my five are grown up now and my two little ones keep me busy. My little ones love to cheer me on to get my books written, but the minute I sit down to write, they manage to ask me all sorts of questions. But I wouldn’t have it any other way. A year ago, my mom stepped in to help with the kids so that I could write full time. My husband and older kids help when their schedules allow. For my household, it has been about team work. You’re a former actress. Did you ever act in a crime thriller? No, I haven’t had the pleasure. During my acting days, I performed in independent films. Drama based. But I’ve performed in commercials. One was with Furniture Row, which I managed to get a lead part. My talent agent at the time was Peter DeAnello. I learned a lot from him about pursuing your dream. It was then that I realized acting wasn’t for me and wanted to be behind the camera. When you are writing are you a meticulous plotter or do you just write and see where it takes you? I come up with ideas, then see where they take me. After the first draft, I create my outline. The Cover of Promised Lies is very dark and creepy. Did you have any input into the design or was it all down to your publishers? To be honest, I just want to write. I’m an amateur at marketing. However, I do know that when I buy a book, it’s because it made me feel something. So, yes, I was on pins and needles, hoping that my publisher would create a cover that would make me happy on the spot. They did just that. They showed me two cover suggestions and I loved the second one the best. They made some changes and it all worked out. My publisher has been very helpful in making Promised Lies the work it is today, and I’m excited for the soon to be released, Her Final Watch. I’m interested in the fact that you established an online library to help crime writers with their research. Could you tell me more about that as it sounds fascinating? Crime Writers Panel was started in 2012 to help writers to learn the accurate procedures, techniques, and tools used by actual law enforcement professionals. I have conducted live interviews with retired and semi-retired first responders, detectives and forensics to share their stories with writers from all genres. Crime Writers Panel is a place to search out what they have shared. Criminal Lines Radio broadcasts are still available online for candid perspectives from our guests. Promised Lies is book one featuring Detective Lily Blanchette. How far have you got with book two and do you have any idea how many books there will be in the series? Promised Lies is the first novel in a series. 50,000 words became 85,000 over two years of edits and plot twists. Book two will be released later this year. The third book in this series is partially complete. I’m a prolific writer between breakfast and afternoon homework with my kids. Writing only one major character’s story has shown me that there is more to tell. Also, there are 2 other series connected to my characters. The first series could be considered a prequel to Promised Lies. It is from Colin Blanchette, Lily’s dad’s perspective and is his story that leads us up to the events in Promised Lies. The second series is an offshoot from the point of view of my antagonist’s family. This is a family connected with the mob and the book shares their exploits and struggles as a family with traditions clashing with the modern world. Fabulous answers, thanks so much Marguerite. 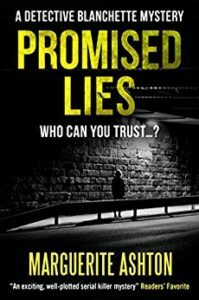 You can buy Promised Lies now on Amazon UK and Amazon US. Or you can have a go at winning one of two ebooks by entering the giveaway below. Great Q&A! 🙂 Happy to have launched this tour with you! Thank you, Nicola for hosting me on your blog! My pleasure, Marguerite. Good luck with the book and the rest of the tour.